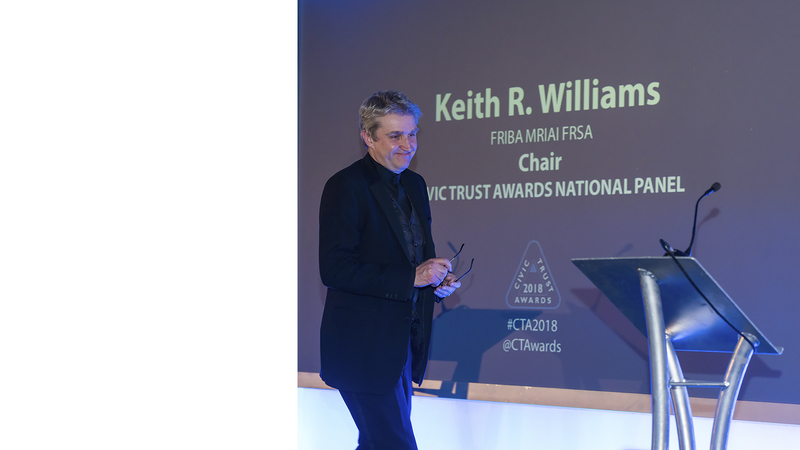 Friday 9th March 2018 : Keith Williams delivered the chairman’s speech to a sold out event at the 59th Civic Trust Awards Dinner in the Sir Alex Ferguson stand at Manchester United’s Old Trafford stadium. Since it was founded in 1959, the Civic Trust Awards has run continuously ever since, making it Europe’s longest running architectural and built environment awards programme. It is also one of this country’s most important and prestigious. For the current 2018 round of the Civic Trust Awards, 234 entries were received primarily from the UK but also from Australia, Belgium, Brazil, Canada, China, Denmark, Hungary, Kazakhstan, South Africa, and the USA, reflecting the awards’ broad geographic reach. Of the schemes submitted, 140 were referred to the National Panel for consideration as potential award or commendation winners. 13 applications were received this year for international projects which shows an increase on each of the two previous years. 18 Civic Trust awards were awarded together with 26 Commendations and 3 Special Awards. Keith presented the final award of the evening, the National Panel Special Award (CTA’s top award) to the team from O’Donnell and Tuomey from Ireland and executive architect Teampannon from Hungary for their joint project for the renovation and adaptation of the Central European University, Budapest.